Tired of maintaining that swimming pool? You're not alone. Hundreds of people every year make the decision to get rid of their pool. We can make the process quick and painless. 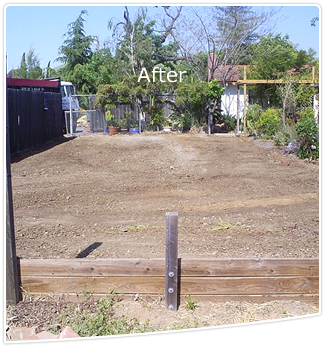 We handle everything from permits, to inspections, demolition, backfill, compaction, and final grade. Just sit back and watch your headaches disappear. Removing your swimming pool is our specialty. All of our equipment is perfectly suited for this task. Our machines are equiped with rubber tracks, low noise emission mufflers, and vary in size. This allows us to get in and out with minimal disturbance to the ground (and neighbors) and complete the job in a timely manner. Dig and Demo makes your job a priority and typically finishes the job start to finish in 3-5 working days. We have perfected our compaction process over the years working with geotechnical soils engineers to ensure that you will never have to worry about sinkage. We guarantee all of our work. We start with a telephone discussion and ballpark price. 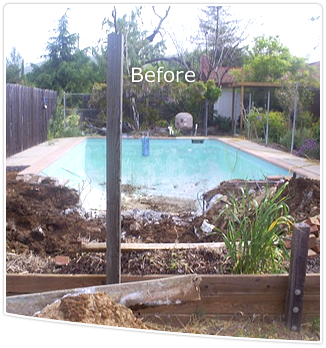 Removal from site of all pool equipment: metal, wood and plastic All concrete broken to 8"x8 " or smaller pieces and placed in pool hole if allowed, or hauled away if required. We meet with you to discuss and plan the removal of your pool. We own all of our equipment, it is small, but powerful. Designed to work in backyards w ith out damage to other areas. Are you ready to get rid of your pool?